As president, vice president, U.S. ambassador to the U.N. and head of the CIA, George H.W. Bush left his mark on global affairs. Bush's tenure was marked by both war and peace. During his time in office, Bush launched the Gulf War and ordered the invasion of Panama, both of which toppled strongmen but resulted in civilian casualties. Bush also worked closely with Soviet leaders to reduce each country's nuclear weapons stockpile and bring about a peaceful end to the Cold War. World leaders offered their condolences to Bush's family after his death on Friday at the age of 94. Here is how leaders around the world are remembering the 41st president. Former President George H.W. Bush arrives on the South Lawn of White House in Washington, May 11, 2008. His Holiness the Dalai Lama offered his condolences to the president's son, former president George W. Bush. "I am saddened by the passing away of your father, President George H.W. Bush. I offer my profound condolences to you and your family at this difficult time. He was, in fact, the first American president that I was privileged to meet. I recall being deeply touched by your father’s concern for the Tibetan people and the situation in Tibet." 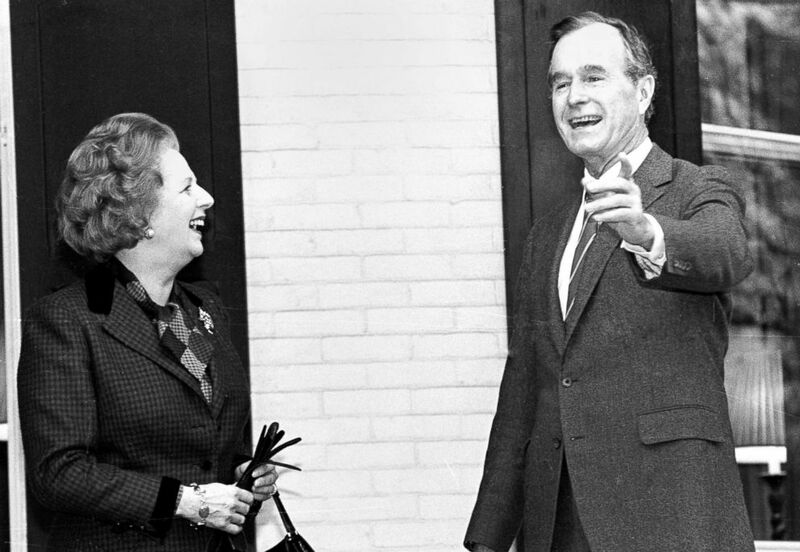 British Prime Minister Margaret Thatcher and U.S. Vice President George H.W. Bush pause for the media on the porch of the Vice President's residence before a breakfast meeting in Washington, D.C., Nov. 15, 1986. "It was with sadness that I learned of the death of President George H.W. Bush last night. President Bush was a great friend and ally of the United Kingdom. He was also a patriot, serving his country with honour and distinction in Office and during the Second World War. Prince Philip and I remember our days in Texas in 1991 with great fondness. My thoughts and prayers are with President Bush’s family and the American people." "President George H.W. Bush’s ethos of public service was the guiding thread of his life and an example to us all. It took him from service in World War II to his stewardship of the CIA and his direction of the Gulf War as commander-in-chief. And in navigating a peaceful end to the Cold War, he made the world a safer place for generations to come. "At each stage of his remarkable career, the President worked side-by-side with his friends, colleagues and counterparts in the United Kingdom. Today, Britain remembers a great statesman and a true friend of our country. We send our deepest condolences to the American people and to the family he leaves behind." "On behalf of the French people, I convey all my condolences to the American nation for the loss of former President George Bush. He was a world leader who strongly supported the alliance with Europe. Our sympathy to his family and beloved ones." Putin addressed his condolences to the former president's son, George W. Bush. 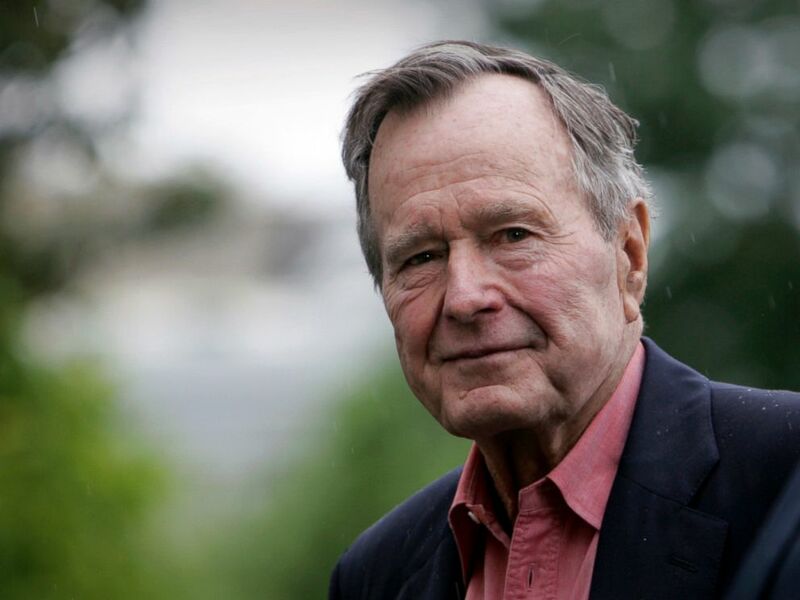 "Dear George, please accept my deepest condolences over the passing of your father, former U.S. President, George Herbert Walker Bush," Putin wrote in a statement posted on the Kremlin's website. "An outstanding politician, he devoted his entire life to serving his country, both as a serviceman during wartime and in high-ranking public posts in peacetime. As U.S. president during one of the most important periods of world history, he showed political wisdom and foresight, and always sought balanced decisions even in the most difficult situations. "George H. W. Bush’s exemplary service and deep commitment to his country informed everything he accomplished over his decades in public life. Sophie and I offer our condolences to his family and the American people on his passing." "His wise leadership at the end of the Cold War helped steer the world to a peaceful transition and the spread of democracy. The people of Israel will always remember his commitment to Israel’s security, his important contribution to the liberation of Soviet Jewry, and his efforts to achieve peace in the Middle East at the Madrid Conference." On behalf of the people of Israel, I send heartfelt condolences to the Bush family and the American people on the passing of a great American patriot, President George H.W. Bush. Merkel wrote to President Donald Trump Saturday that America has lost “a great patriot and statesman," the Associated Press reported. Dubai's ruler, Sheikh Mohammed bin Rashid Al Maktoum, who also is the UAE's prime minister and vice president, tweeted that Emiratis remember Bush as "a firm ally and friend." Our condolences to the Bush family and to the American people on the passing of George H.W. Bush, who we remember as a firm ally and friend..
Kuwait's ruling emir, Sheikh Sabah Al Ahmad Al Sabah, offered his condolences to Bush's son, the former President George W. Bush. Sheikh Sabah also offered condolences to current President Donald Trump. As president, George H.W. Bush led the 1991 Gulf War that freed Kuwait from Iraq. The country's KUNA news agency reported that Sheikh Sabah praised Bush's efforts to "create a new international order based on justice and equality among nations," according to the AP. "On the behalf of the New Zealand Government, I wish to acknowledge the contribution President Bush made to international affairs over decades of service to the United States of America," Ardern said in a statement. "As an American envoy to Beijing, as CIA director, as vice president for eight years and then four years as president, George H.W. Bush’s statesmanship played a key role in helping to end the Cold War, which bought democracy to millions of people in Europe and diminished the threat of nuclear war. "George H.W. Bush was a strong supporter of the international rules-based system, the rule of law and democratic values. Our deepest condolences are extended to the Bush family and the people of the United States of America at this time." "George H.W. Bush was above all else a family man and, for him, the American people were part of that family. In public office, he served as he lived, with compassion, courage, dignity and grace. As president, he saw America’s obligation to the world and honoured it — and he remained committed to public service until the day he died. "I feel privileged to have worked with him, and even more privileged that he became a lifelong friend. He was, quite simply, one of the most deep down decent people I have ever known. Our hearts go out to his family, but they will take great comfort in the knowledge that their brother, father, grandfather and great-grandfather is now reunited with his beloved wife Barbara and their daughter Robin." President George H. Bush, left, and Soviet President Mikhail Gorbachev sit together at the Soviet Embassy after meeting in Madrid, Spain, Oct. 29, 1991. Former Soviet premier Mikhail Gorbachev expressed his "deep condolences" to the Bush family and all Americans following his death. 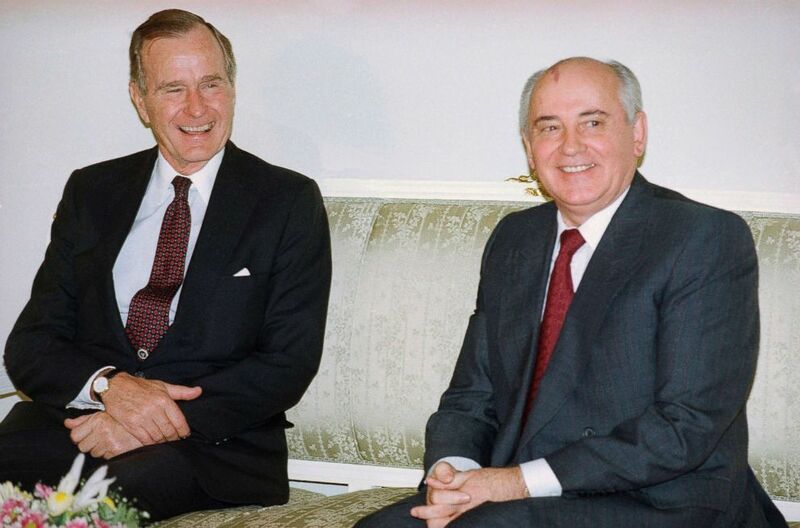 Gorbachev worked closely with Bush to bring an end to the Cold War in the late 1980s and 1990s, and lauded the former president for his abilities as a politician and his personal character. "It was a time of great change, demanding great responsibility from everyone," he told the Interfax news agency. "The result was the end of the Cold War and nuclear arms race." "In 1989, as the blocks wavered and decades of confrontation began to crumble, #GeorgeHWBush boldly seized the chance to end the Cold War. He, too, is the architect of German unity. We mourn the loss of a great statesman and a friend of Germany," Maas tweeted in German. ABC News' Rashid Haddou-Riffi contributed to this report.